Autumn. It seemed like the summer would never end, but that fortune teller was right. It's over. Autumn, the time of the harvest. Agriculture has advanced significantly in recent years, ever since the discovery of the maxim, "leaves of three, let it be." Autumn, a time of celebration. The peasants have spent a hard week scything hay in the fields, but tonight the festivities begin, starting with a sumptuous banquet of roast hay. Then, the annual nose-stealing competition. Then you have two jesters, one who always lies, one who always tells the truth, both hilariously. This celebration will truly have something for everyone. This is the 5th addition to the game of Dominion. It adds 13 new Kingdom cards to Dominion, plus 5 unique cards. The central theme is variety; there are cards that reward you for having a variety of cards in your deck, in your hand, and in play, as well cards that help you get that variety. Other products in the "Dominion" series. 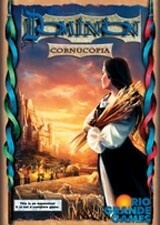 My friends and I absolutely love the game Dominion and Cornucopia is a wonderful addition to the series. Having a wide variety of cards in your deck is key to winning in this expansion. The prizes also add a unique element that is sure to mix up every game you play! I was beginning to think that all of these Dominion expansions were getting out of hand but each one adds something great to the game. I was surprised at how these new cards added a fresh twist to the game. My favorite is the Tournament card and the great Prize cards you can win with it. As with the other expansions, this is a must have. Ahh, cornucopia. Again, I'm going to write this review as if you already know about Dominion: Cornucopia is a smaller box, and it's theme is variety. I think corcnucopia's a great expansion especially because it introduces a lot of variant strategies. Favorite cards: - Hunting Party - Fair grounds - Young Witch ( a fun curser to play with!) - Horn of Plenty ( some amazing combos with this!) - Menagerie -Jester ( annoying, but cool!) Least favorite cards: - Harvest. This card is actually very bad compared to other 5-cost coins. - Tournament. Many people love it, but I feel like it doesn't really add anything to the game. - Hamlet. This is a GREAT card, but it's really complicated and people take forever to think when they're playing it. I tend to avoid it even though it's awesome.